Bahudaka dasa has been the president of the Vancouver ISKCON center for six years. 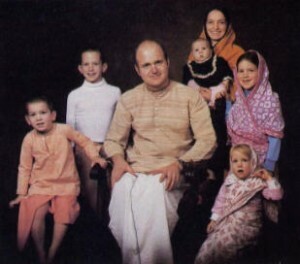 When he first joined, in 1970, the center had only four full-time devotees. It is now a community of more than ninety. The community has recently moved to a woodsy eight-acre estate in Burnaby, a Vancouver suburb. Like all other ISKCON centers, it is open to the public. I guess I’m a kind of model Canadian citizen. My father was always active in the community. He was mayor of Saanich, Victoria, the city that I grew up in. He was chairman of the school board, and all sorts of things like that, and then he was a member of Parliament for eight years. When I was in grade eight we moved to Ottawa, the national capital. I went to high school there and was president of my graduating class. I had a scholarship to McGill University, the country’s most prestigious school. But halfway through my studies I got married, so I came back to Victoria. My father gave me a house there. By the time I was fifteen or sixteen, I had completely rejected God. Previous to that I’d gone to church every week, so it was like a big traumatic thing for me. I just gave it all up and actually became very inimical to religion. In fact, I remember that when I was in grade thirteen (that’s like the first year of college) I used to be the chief cynic. We’d look around during the Lord’s Prayer, and anyone who was saying the Lord’s Prayer, we’d harass him afterwards. But then, in the university, I was studying psychology and philosophy, and I became interested in consciousness. I read a book by Eric Fromm it might have been The Art of Loving and I really became interested in man’s inner activities. I was reading other books also, and they just kind of stimulated my interest. And I wanted to pursue this interest in my studies. My mother had always wanted me to be a doctor, so I figured I’d become a psychiatrist. But at the university I found it very frustrating, because the professors had no actual knowledge. Gradually I could see that. All they had were speculative theories, which were just like fiction, practically. They didn’t give you any solid information. And every year that went by, I just became more and more disgusted with the whole process. In my final year I just hated it, but I stayed in to get my degree. Anyway, by the time I finished my studies I was very disillusioned with university and that whole style of life. I’d become more interested in the Western self-realizing or self-actualizing psychologists, and that got me more interested in Eastern philosophy. I was reading Carl Jung and Gurdjieff and Ouspensky, and then I started to read Eastern books. Gradually I was getting more and more interested in the spiritual side of psychology and philosophy. It was right in my last year of university that I first came into contact with some chanting. A friend of mine was chanting, and I was a little interested. And at the same time I was very interested in music. That was my biggest side interest I used to play instruments and sing. I was into folk music, and sometimes I’d play in coffee houses. Every day I would spend hours in music, but gradually I was getting tired of it all. I’d go through so many different styles and get tired of them. I was looking for some new form of music, something really satisfying. So because of my interest in music and psychology, I kind of put the two together and started chanting Hare Krishna. By the time I finished university, I was married and had a child. Then I went through a real period of decision-making, and I decided that I wasn’t going to go on in what I considered materialistic life. Up until that time, I was still pretty much a golden-haired Canadian boy, doing everything my parents wanted me to, sort of leading a double life. So I decided to give it up, and I moved to a commune in Bella Coola, which is up north in British Columbia. It was very simple. There was no electricity and no running water you had to get the water out of the well. It was a very simple life, and you could think more. And at that time we became much more interested seriously interested in spiritual life. It was no longer just a hobby, but was really starting to mean something to me. Also, right at that time there was a girl there who knew something about Krishna consciousness and really liked chanting Hare Krishna. I had heard the chanting before and had done a little bit, but it was very superficial. But this girl was so enthusiastic about Krishna consciousness that she would even make sure that we offered all our food to Krishna. The funny thing is that at that time I was so opposed to the idea of God being a person that if I’d known what the chanting meant, I wouldn’t have done it. In fact, one of my friends gave me the Bhagavad-gita, and after I read one page of it, I wouldn’t read it any more. “Krishna the Supreme Personality of Godhead.” I didn’t like that. I wouldn’t read the Gita or the Srimad-Bhagavatam I looked at some of the Back to Godhead magazines, and I thought that they were kind of like Bible stuff, so I looked down on it. I didn’t like the philosophy. But every evening in this commune we used to get together for about an hour and a half of music, and I was like the musical leader. At first we would chant Hare Krishna just as a small part of our routine, but gradually we got more and more interested in chanting Hare Krishna. It kind of took over. Also, we were growing our own food, and we were mostly vegetarian, although once in a while we’d eat fish, because there’s a lot of fish out there. Anyway, the women were offering the food to Krishna, which I didn’t know at the time. I couldn’t understand why we liked the food so much. We were just going nuts over this food. So actually Krishna had already tricked me, because I was eating prasada, spiritual food offered to Him, and I was chanting His names and I didn’t know what I was doing, but I liked it. Actually, after coming out of the university I was very cynical, very puffed up; plus my thinking about God was very impersonal because of the books I was reading. But the prasada and the chanting they just softened me up. In fact, I can remember very distinctly: I had one experience just at the end of summer, when I was chanting, that just came from within because I wouldn’t have accepted it if anyone had told me. I was chanting as usual, and all of a sudden I had this distinct idea … it was like a realization: Why not chant like you’re chanting to Krishna, instead of like you are Krishna? It just came to me, that it should be like worshiping. Actually, I had thought I wasKrishna. I never had any concept of devotion to God, because I couldn’t think of God as being outside of myself. But the moment I thought this other way, I felt so much ecstasy that tears came to my eyes as soon as I thought like that, as soon as I changed the attitude of the chanting. At the end of the summer I went down to Vancouver with some other members of the commune. Actually, we went way over to Victoria, but then we made a special trip to Vancouver to visit the Krishna temple, because one of the members of the commune had been there before. At that time the temple was on Raymur Street, which is a little street in the midst of industrial Vancouver, right across from the B.C. Sugar Refinery. You’d go through this horrible part of town, with smells and junk yards, and then you’d reach this beautiful temple right in the middle of it. It was like a lotus flower in the midst of a garbage dump. Quite dramatic. And as soon as I walked into the temple it was an incredible experience. I had already done a lot of chanting, so I was very sensitive to the spiritual atmosphere. I was immediately attracted. It was like being a kid in a candy shop, I felt so attracted. Actually they were having a kind of festival. The devotees from Seattle had come up. So there were about fifteen devotees, instead of the usual four, and they were all chanting. At first I felt ill at ease. The room was brightly lit, and I’d never seen devotees dressed in their robes before. They were dancing, and my mind was saying, “Oh, they’re just phony. They’re putting it on.” But then I looked over, and I saw that the guy playing the drum had this big grin on his face it was so ecstatic, and it just immediately made me enthusiastic. And I started to dance, and I felt real ecstasy, which was a completely new experience. It was natural, this feeling of joy that was coming from within, without any intoxication or anything. It was a more powerful happiness than any I had ever felt before my first real religious experience, I would say. I was very affected by it. And I stayed at the temple for a day and a half. The atmosphere was just so pleasing, so spiritually pleasing. It was a very powerful experience. But, then, of course, I wasn’t willing to surrender right at that point. My friends and I had a little business going in Shawnigan Lake, in the country, about forty miles from Victoria. We were trying to sell wood and things. But after this visit we became very interested in Krishna consciousness. We invited the devotees over to see us at the house where we were living, and when they came we practically surrendered to them we just did everything they said. They taught us how to do everything in Krishna consciousness, and we kind of set up our own temple we actually did. After that we offered our food on our altar, we had classes, we cooked for Krishna, and we would visit the temple in Vancouver once in a while. So in this way we very quickly became absorbed in Krishna consciousness. Now, in retrospect, I can see that I didn’t understand anything about the philosophy for at least a year. I was such an atheist that it took me months and months to even begin to comprehend what “God” meant. I was so deep into my own mental ramblings that I just could not understand the philosophy. But I liked to chant, and I liked the devotees, and I liked the prasada. I couldn’t deny the way I was feeling. But I was very much averse to coming into the city, and that was one of the reasons I hadn’t become a devotee right away. I remember the first or second time I went to the Vancouver temple. I had been living in the country, so I was very unhappy about being in the city. From Bella Coola I had come down the coast by boat, and when we got into Vancouver I just couldn’t believe it. I’d been way up north, and all of a sudden everything started to change all the plants started to lose their color, and the city was covered with a pall of smoke. I’d been away in the country, and the city was so ugly it was terrifying and the horrible way of life people had condemned themselves to. But I remember that when we went out chanting, right downtown in the middle of Vancouver, I could see we weren’t in the city at all we were completely in a different atmosphere, a spiritual atmosphere, by chanting the holy names. After that my friends and I used to go out chanting ourselves. Sometimes we’d go down to the University of Victoria, right into where everyone was having lunch, and we’d chant. We were pretty bold. And Krishna must have liked that, because He helped us surrender to Him, more and more. There was something else, also, that happened right around this time, when I was first becoming a devotee. I was becoming much more open to the idea that God is a person, and so my mother convinced me to go back to church because she was a bit afraid I was going to become a “Hare Krishna.” So I went to communion. Of course, I’d been doing this all my life, but it never meant anything to me. But when I went to the service after chanting Hare Krishna, it was a different story. I was very attracted and interested. When I said the prayers, they meant something to me. I felt moved. In fact, when I took communion I felt much more spiritually conscious than ever before. I actually felt ecstatic. So I could see that the potency of chanting Hare Krishna actually cleanses your heart and makes you more receptive to God. I had these experiences a couple of times. Still, I wasn’t interested in cultivating Christianity, because I realized … When I was living up in the country I had totally given up cigarettes, but when I came back to the city I began smoking again, on account of the bad influence. And even though I’d had this wonderful experience in church, fifteen minutes later I was smoking a cigarette. I knew it was wrong. So I realized that just having a wonderful experience wasn’t enough. To actually become pure, one has to change his consciousness so he can have that experience all the time. And I could see that the devotees were doing that. Then, after a few months, my friends decided to go to Vancouver and move into the temple, and I went down to Victoria, where we rented a house and invited a devotee to come up from Seattle to get things organized. So in that way we started a temple in Victoria. I stayed there about a year, and then my family and I moved to the temple in Vancouver, where we’ve been ever since.